Conjoined twins born in Siam. Toured widely in the U.S. before settling nearby to farm, 1839. 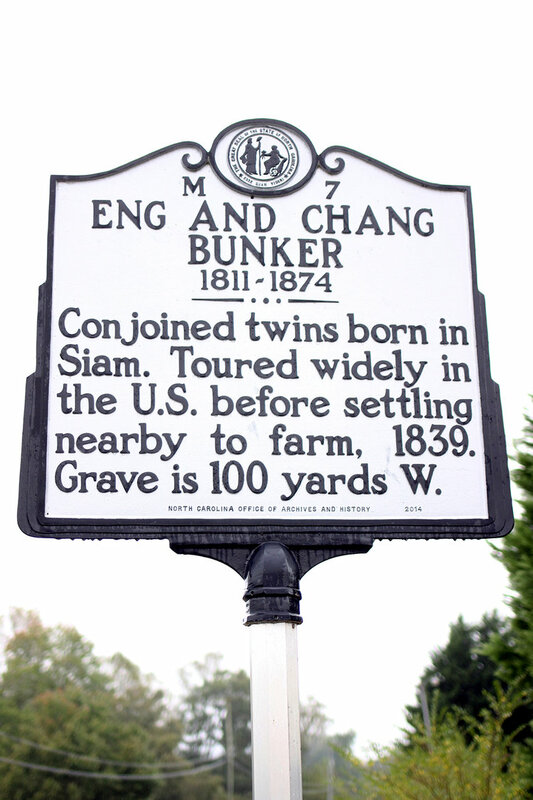 Grave is 100 yards W.
Eng and Chang Bunker, the first conjoined twins to receive world-wide renown, were born in Meklong, a fishing village in Siam, in May 1811. The twins, whose nationality became the name for the birth defect, were completely normal except for a thick band of skin that connected them at the chest. Although their abnormality initially horrified villagers, they gradually gained acceptance within their community, and raised ducks to support their family. In April 1829, New England sea captain Abel Coffin and Scottish trader Robert Hunter, having heard stories of the twins, convinced them to come to America with them. The men arrived in Boston that August, having learned basic English along the trip. For the next eight years they traveled across the United States and Europe, first under the supervision of Coffin and Hunter, then later with renowned circus and sideshow operator P. T. Barnum. Along with providing exhibitions of strength and dexterity, they proved popular with the medical community who enjoyed conducting tests on them and suggesting reasons for their malady. In their mid-twenties, the twins made the choice to remain in America, break with Barnum, and manage their own shows. When notified that they would have to adopt a surname to obtain American citizenship, legend has it they took the name of a bystander, Fred Bunker, who suggested they use his last name. Touring with their own show, the twins acquired considerable wealth. Tiring of the road, they took the suggestion of Dr. James C. Calloway of Wilkesboro, whom they had met in New York, and visited Wilkesboro. Finding the area hospitable, they decided to settle in the nearby community of Traphill where they opened a general store. Having settled into the community, the twins eventually found love with two sisters, Adelaide and Sarah Yates. To the consternation of some in the community, the couples were married on April 13, 1843. Eng and Sarah Bunker eventually had eleven children, while Chang and Adelaide had ten. With the exception of two of Chang’s children who were born deaf-mute, the remaining children were born without abnormalities of any kind. Eventually the two brothers realized that their expanding families would require two separate homes. 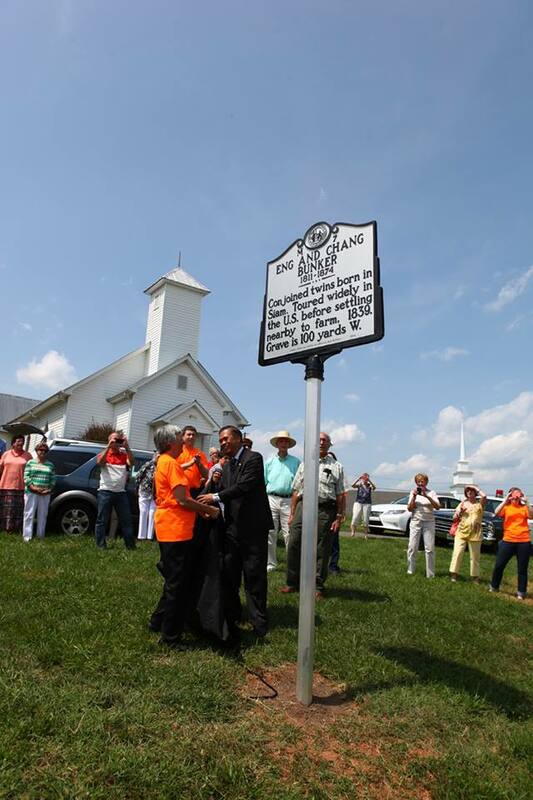 In 1846 they moved to nearby Surry County, where they constructed two houses nearly a mile apart. The twins took turns visiting each home every three days, a pattern they continued for the remainder of their lives. Their wealth, based off of farming, was quite substantial. In addition to owning eighteen slaves in 1860, the twins owned real estate and personal property worth over $25,000. The Civil War devastated the family’s wealth. Chang’s son, Christopher W. Bunker served as a private in Company I, 37th Virginia Cavalry Battalion, was captured late in the war, and served nearly a year in prison at Camp Chase, Ohio. Eng’s son Stephen D. Bunker served in the same unit, and was wounded twice before the war’s end. With their farms in financial distress, the twins chose to reunite with Barnum and go on tour again. The twins traveled to Europe where along with their shows, they searched in vain for a doctor to separate them. During the time abroad Chang began to drink heavily, embittering the two against one another. While on their return voyage in 1871, Chang suffered a stroke that left him partially paralyzed. He recovered in part, but his health was never the same. On January 12, 1874, Chang was stricken with severe bronchitis. The condition worsened and on January 17, he died in his sleep. Eng awakened and, horrified by the sight of his dead twin, quickly fell into paralysis. A doctor was summoned, but did not arrive until after Eng had died. An autopsy conducted in Philadelphia determined that although nothing organically was wrong with Eng, he actually died of fright. A partial examination of their connective band however demonstrated that they shared numerous blood vessels and an artery. Therefore Eng may have died from loss of blood from Chang’s dying body. The two were buried in a common grave at White Plains Baptist Church cemetery in Surry County.